I’ve been asked to salvage a couple embroidered figures from a piece of ecclesiastical embroidery. I said yes, without first having seen the pieces in person…which could have been a mistake. But, hey! I love this kind of work. There’s no set deadline, either, so I don’t feel super pressured about it. My excitement will provide momentum (I hope! ), even without a deadline. Now that the piece has arrived, I’m thrilled about the project – it’ll be interesting, and it will be challenging to pull the whole project off successfully! I thought I’d share my explorations with you. Along the way, we’ll run into some snags, I’m sure. But we’ll muddle through! And, whether you’re into ecclesiastical embroidery or not, I’m betting we’ll pick up a few tips along the way that can be applied to other types of embroidery, too. Today, I’ll introduce you to the original embroidery and talk a little bit about it. This is the background: the piece above is a sales sample. It originated most likely between the end of the 1800’s through the first part of the 1900’s. It’s a partial (and smaller) chasuble, which is a robe worn in the Catholic and Anglican churches by the priest during Mass. Houses of embroidery, convents, and other institutions that specialized in ecclesiastical embroidery would often make smaller, partial samples of embroidered pieces, to include in a portfolio so that the customer could feel, touch, and see what the finished garment would be like. The sample has a numbered tag inside, for ease of ordering. This piece represents the embellishment for the back of a chasuble. Notice on this particular piece that the right side is cut off. The chasuble sample is significantly shorter than usual, with both the top and the bottom truncated a bit. The ground is a silk satin and it is lined with red silk. The figures on the piece are the main focus for my particular project. 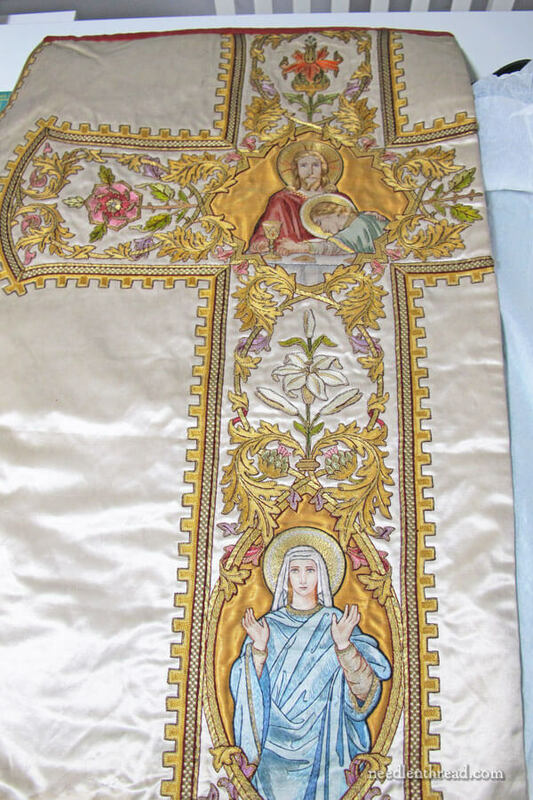 Typical of this style of vestment, which is obviously made by a company that produced many vestments that were very much alike, the figures are made up of appliquéd fabric that was hand embroidered in silk for the details. The hair, the eyes and other details on the face are all embroidered. The face is a silk ground in a pale skin tone, highlighted with stitches. The garments on the figure are silk in a pale blue. The fold lines are stitched using a dark stem stitch and the shadows or highlights on the garment are worked in straight stitch or long split stitches over parts of the fabric, leaving other parts of the fabric exposed. Some areas are entirely embroidered with long and short stitch, too. This method of using fabric appliqué mixed with hand embroidery was fairly common from the mid-1800’s onwards. With the industrial revolution, we became, as a whole, a people used to getting things made quickly and less expensively, thanks to machines. In order to fulfill the demand of a quick and affordable turnaround on hand embroidered vestments, the fully embroidered figure was replaced with the partially embroidered figure that looked like hand embroidery from a distance, but wasn’t quite complete hand embroidery. While this type of figure embroidery is certainly not the same quality or artistry found in the figure embroidery that emerged in England in the Middle Ages and spread to Belgium and Flanders and beyond during the Renaissance, it is still fairly decent, when it comes to producing a figure that, seen from a distance, is expressive and clear. While earlier figure embroidery often involved a real artistry on the part of the embroiderer and on the part of the designer or painter who might have been involved in the initial planning of a design, these types of appliquéd figures required only the skill to stitch neatly and quickly. Everything was mapped out – the design of the piece, the color layout, what threads to use, what stitches went where to produce the desired result. Occasionally, you can find these particular figures (in these exact designs) that are stitched very well, with the facial details being clear and, again, expressive. This is the case with the two figures on this particular vestment (keep in mind, after all, it was sales sample). I’ve seen these figures stitched on lesser-quality vestments, with somewhat disappointing results. If the face isn’t just right – and especially the eyes – the resulting figure can be more of a distraction than anything else! So, as far as the figures go, they’re worth salvaging. Why not use them, if they’re usable? The central figure on the vestment is Christ with St. John. You can tell that the design style here, while it is very traditional and very clear in the story being told (St. John, the “beloved apostle,” rests his head on Christ’s heart during the Last Supper – a story that most folks attending church regularly would be aware of), is not the same high level of artistry that is seen in earlier vestments of the 12th – 18th centuries, and even the more expensive vestments produced during the 19th and early 20th centuries. Notice, for example, the chalice (cup) and its simplicity and lack of depth. The hands are very simply executed, filled with one color of thread, with some fabric exposed, and outlined with a dark thread around the nails and the fingers. In a way, the overall effect of the piece is somewhat reminiscent of a filled-in coloring book image. Now, don’t get me wrong. This is not a criticism of the embroidery or of the original designer. This is simply what was produced at the time, for affordable embroidered vestments. And they are, in a sense, beautiful. When they’re seen from a distance (which is the whole point), they are attractive. They’re just not “high art,” compared to other approaches to ecclesiastical embroidery. The face, though, is a little more artistic and a little better executed. This is where the more skilled embroiderers did their thing. From sources that I’ve read, I’m sure this was normally the case – the embroidery on the figures was done by more than one person. The faces were worked by the more experienced and skilled embroiderers in the workshop, while the more simplistic elements were done by those who had the skill to be neat and precise and work with fine threads, but not necessarily the skill to handle the more demanding facial features. I’m very eager to take the back off this piece and examine how the different elements were put together. There is definitely some appliqué work going on with some of the embroidered foliage. You can see this from the front, where the foliage overlaps the medallions the figures are set in. But I suspect the rest of the foliage on the cross is worked directly on the ground fabric, which is most likely backed by linen. The colors on this piece are still fairly good and bright – it’s really the gold that’s aged the most, giving the piece that patina that comes with oxidized gold threads. And the embroidery over all, even on the foliage, is in fairly good shape. In fact, the gold threads, though oxidized, are intact on the whole piece. It’s rare to see that on a piece of this age, but the reason is pretty obvious: as a sales sample, it didn’t get used much! You might remember this piece of ecclesiastical embroidery that I based my Mission Rose project on. The gold threads on that were perhaps less oxidized, but definitely showed more wear and tear, with the embroidery coming apart completely or missing altogether in some areas. Although the foliage and the floral elements are in fairly good shape, and they are somewhat pretty, in taking the piece apart, they will most likely become useless. Perhaps they can be salvaged for framing, but as “whole” pieces, they won’t be salvageable. If this were art embroidery of great value, the outcome for the foliage would concern me, but in fact, as far as this style and type of embroidery goes on old ecclesiastical vestments, this stuff is fairly common, workshop-assembly-line produced stuff. It isn’t of much value in the whole history of embroidery, or even in any particular embroidery niche. So that’s an overview of the piece. In the near future, we will look at the elements close-up, we’ll discuss some definite pitfalls when it comes to taking it apart, and we’ll examine the inside of the vestment – the back of the embroidery, underneath the lining – where we will learn a lot about the individual parts that make up the whole, and how the whole was assembled. Down the road, when we eventually get to that point, I’ll show the process of applying the embroidery to a new ground fabric – and not just any ground fabric, mind you! A fantastic fabric that you don’t see too often these days! Finally, if the decision is made to go forward, I’ll share the whole process of embroidering new goldwork frames for the figures. This process will take a good amount of time, so we’ll only be visiting this project every now and then. I hope you’ll join me in the adventure, asking plenty of questions along the way and providing suggestions and ideas, too! If you have any questions, comments or suggestions, anything that befuddles you, any worries or concerns, any ideas about what lies ahead, feel free to join the conversation below! When you refurbish this piece are you going to complete the areas that are missing? The right arm of the cross and the very top of the cross? Hi, Barbara – Sorry, I guess I didn’t clarify…I’m salvaging the figures only, not the whole piece. I don’t plan to recreate the cross design, just salvage the figures and put them on a new ground fabric, with a new frame medallion frame around them, so that they can be used on a new vestment. Ecclesiastical Embroidery is very appealing to me. I have a couple of your e-books and hope to make something some day. And I look forward to your progress on this project. 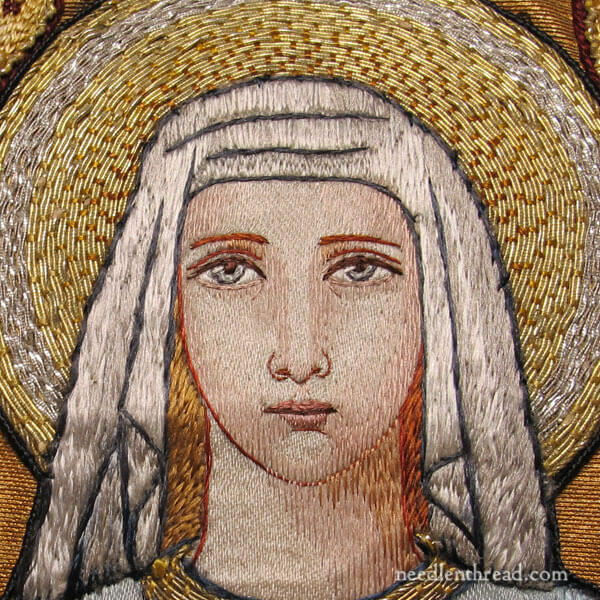 Thank you for talking about beautiful ecclesiastical embroidery. I was wondering, though, where did this piece come from? It is very nice for a sample work. I feel so fortunate to be a part of this “inside look” at antique vestments and Ecclesiastical embroidery! What you wrote today is fascinating! I’m looking forward to your future blogs regarding this reparation work. Thank you! It will be fascinating to follow you work your needlework magic. Thanks for sharing the project with us. I do hope you will save the portion with the lilies to frame. It is lovely as well. This is going to be good. Please keep us informed on your progress, with details. This is a very interesting piece of work, thank you for sharing it. It can be seen quite clearly that the faces have been worked by more experienced/skilled embroiderers. I agree that the periferal details are more simplistic in design and it is often said that hands are the most difficult body parts to draw. I noticed St. John’s hands in particular. The right hand is palm upwards, with what is meant to be the thumb, passed through between the forefinger and middle finger of the left hand. This is a very unnatural position (try it!) and it appears from the stitched piece that the thumb is at the wrong angle to the hand, as we are given the top view with the nail rather than the side/underside, which would be seen with the hands in this position. That said, this is a beautiful piece of embroidery and it would be a real shame to not be able to salvage all of it as the flowers and foliage are exquisite. Mary, I wonder if parts of the foliage would be salvageable as embellishments for crazy quilting. You know that’s my thing and even small pieces of the florals and foliage would be wonderful in a CQ piece, especially as CQ is generally for show and gets little wear. This was an especially interesting post, Mary. 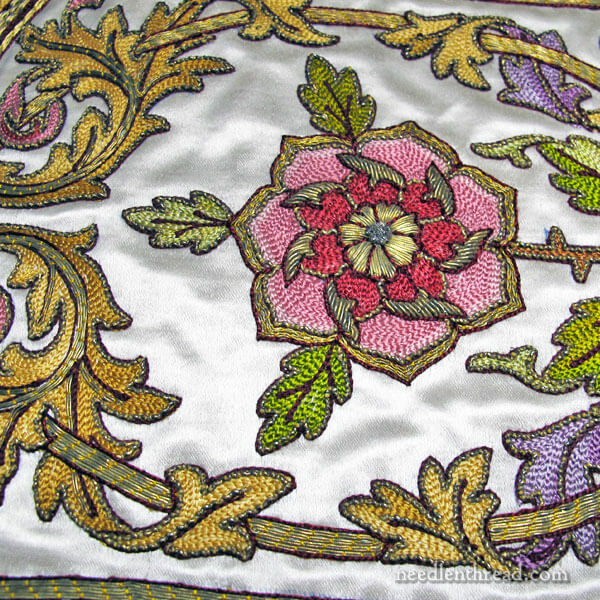 Ecclesiastical embroidery is dear to my heart, and I was recently privileged to be asked to restore a vintage chasuble. Much of the goldwork on the piece was severely deteriorated, and I was required to remove the lining of the piece in order to restore the embroidery. It was a lengthy, but educational and rewarding process, and the chasuble is once again in use. I am very interested in this process!! Step by step with lots of photos please! And any thoughts of why you are making the decisions and any reference links you may have along the way. Will there be an ebook in the works of this type of rescue and repair? I would love to be able to work on one of these historical pieces. How does one find this type of work to repair/rescue these beautiful works of art? You have no idea how much I will be hanging on your every word!! As a priest in the Episcopal Church (The Diocese of Atlanta), I am glad to read your column about ecclesiastical embroidery and will follow your good work with great interest. It brings to mind that in seminary we were taught how to write icons by instructors from the Prosopon School of Iconology in an intensely detailed and exciting process. Prayers accompanied every step we made. Mary I’m curious as to how today’s threads will compare with what you are salvaging and does that increase the challenge. Looking forward to following along. What a lovely piece of embroidery and what a lovely piece to salvage and revamp. I do hope you can find use for the floral pieces as they are lovely. Are you going to put the two embroidered figures together on one fabric or will they be separate pieces. It going to be so interesting to watch your progress on this project I’m looking forward to it. I’m also interested in what ground fabric you will be using. Thanks for sharing this beautiful ecclesiastical embroidery piece with us what a challenge I really look forward to your progress on the piece. Really interesting! I look forward to following your journey with these. This will be a wonderful adventure. Thank you for taking us along. I have a request: when you reference earlier, finer embroideries as compared to this one, could you put them side by side for comparison? Very interesting! I especially liked how you got closer and closer to the fabric/stitches on Mary, and the details you could see close up that blended in and weren’t as clear when seen far away. I’ll be looking forward to further progress posts on this. This project looks like it will be both challenging and fascinating. Best of luck with it. Like all the other commenters, I will be following your progress with interest. I’m looking forward to future posts on this project. I’m a history geek, so I love digging into the back story on these sort of things. I have one question, though: how do “gold” threads oxidize? Gold is the one precious metal that doesn’t oxidize, so I’m wondering if the metal used in “gold” thread is some sort of alloy that is simply gold colored. It definitely doesn’t have a very high content of true gold. Just curious…. Hi, Joyce – gold threads are really only gold on the outside! They are an alloy, usually with silver. Do you get these types of specialized “fix it” requests often? I do, but I have to be judicious in the ones that I take, because they take so much time and require a lot of energy, concentration, and work – which takes me a way from my other work! When I can – under the right circumstances – I take them. Mary you are taking on an arduous, interesting and rewarding challenge. I am a member of the Ecclesiastical Sewing Group at St. James Cathedral in Toronto and we have worked on several beautifully embroidered pieces for restoration. We are presently restoring a 100 year old cope for one of the churches in our area and it has taken over 2 years so far and it isn’t quite finished yet. We do only work for five hours a day one day a week. We shall be following your progress with great interest. What a great project to take on. I’ll be very interested to follow progress, especially after visiting the fabulous Opus Anglicanum exhibition at the V and A in London earlier this year. Oh, Mary, now I must come and stay with you! Far too much work for one pair of skilled hands :). Do you know where the piece was made? I don’t know much about embroidery workshops outside the Netherlands and the German Rhineland. Looking forward to follow you along on this lovely project! I’m not sure where it was done, Jessica. It’s got a item number tag on it (like a catalog tag) that’s hand-written, but no clue as to where it was originally made. Oh, what a shame. I’ve got the funny feeling that I’ve seen this design before. I have a commission to get out of the way, but then I will have a look through my pictures and books to see what I can come up with! Can you share a picture of the tag in a future post? It is possible that someone recognizes the style and can pinpoint you to the workshop. I don’t see anywhere where there is a need for repair. There’s no need for repair, exactly. But it’s unusable as it is, due to the fact that it’s not a complete design. So the figures will be salvaged from the incomplete design so that they can be used again. Oh this looks like it will be so much fun! Can’t wait to see the backs. I remember during college, doing volunteer costume cataloguing at a museum, how much fun it was to see the inside of the garment, and track the alterations by the different stitching. I also probably learned more about kimonos by taking one apart (to salvage the fabric) than I ever learned by making one. Hope you can also salvage what as embroidered directly to the satin. It could now become an applique. Going forward what would be the best way to protect the gold threads in this piece? Does a frame with glass over slow down or stop the oxidation? For museum quality piece is there a way to hermetically seal a piece in a frame? Most framing options don’t hermetically seal the piece. But framing goldwork under museum quality class and taking care of its placement (out of sunlight, in a controlled environment) will certainly slow down the process. Wonderful article today. Looking forward to the entire project as you proceed with this. Most of my questions were asked already so I’ll sit back and wait for the answers. I really enjoy your “archeological digs”, Mary! I learn so much from them. Mary, I shall follow this project avidly. 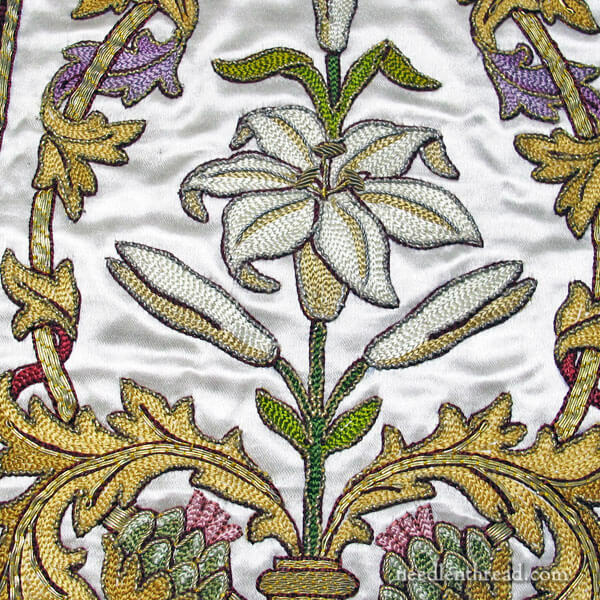 I have been asked in the past to revive elderly church vestments, but have no goldwork experience, and lacking confidence I declined. Even cleaning can be fraught with the colour red bleeding in a truly terrifying way. All I can say is WOW!! I will be following this project closely, you have taken on a massive project and I know the out come will be absolutely gorgeous. This piece is incredible! I am looking forward to watch the progress. I love it when old embroidered pieces can be salvaged and turned into something new. I think it’s wonderful to be able to preserve and even renew such art. I can’t wait to see more as you work on this project! What a shame the design isn’t complete, I like the foliage more than the figures, though the eyes are nicely stitched… oh well! So what’s the new ground fabric? Hi, Renee – when it arrives, I will definitely show it to you!! Love this project! Looking forward to all the updates. Thanks for bringing us along on your current journey of discovery. Mary, I look forward to every bit of information you provide no matter the topic! Its always special! What an excellent opportunity to deconstruct a piece and actually have very usable elements left to salvage. So often I see pieces that have no meaningful life left and it comes to a choice of doing nothing or just stabilization. Looks fun and interesting! Its wonderful too see someone else is trying to save and restore these precious vestments, etc. 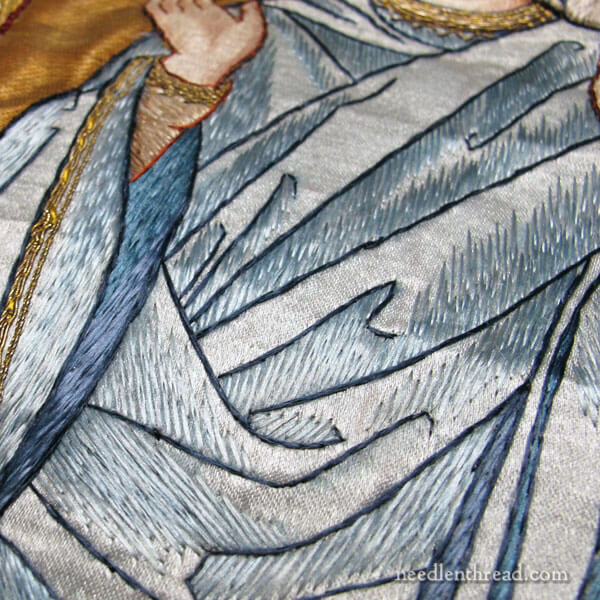 I have one question, please, do you know of any way to restore and remove the tarnish on the silver and gold threads so widely used in these works?Thank you Mary for sharing with us your great work. Hi, Ross – the only way to really restore the splendor of the original goldwork on this type of piece is to replace the threads. It wouldn’t be worth it on this piece, but on some vestments, it is worth it, if the work is of particular beauty and intricacy. The nice thing about this sample is that the gold threads on the actual figure embroidery are still in good shape. They are most likely synthetic Japanese gold, which makes me think that the piece is from the early part of the 1900’s. The other goldwork threads that have tarnished badly – on the floral elements and on the galloon, for example – wouldn’t really be worth replacing, unless you were planning to salvage the floral elements for some other purpose. While the subject matter of the embroidery is not of interest to me, I find the process of analyzing the piece, as in today’s post, fascinating. I am very interested in following along as you take it apart to determine its construction and then decide how to proceed with it. I love the historical aspect and the technical details you are providing. Keep it up, please. Wow! This is BEAUTIFUL! 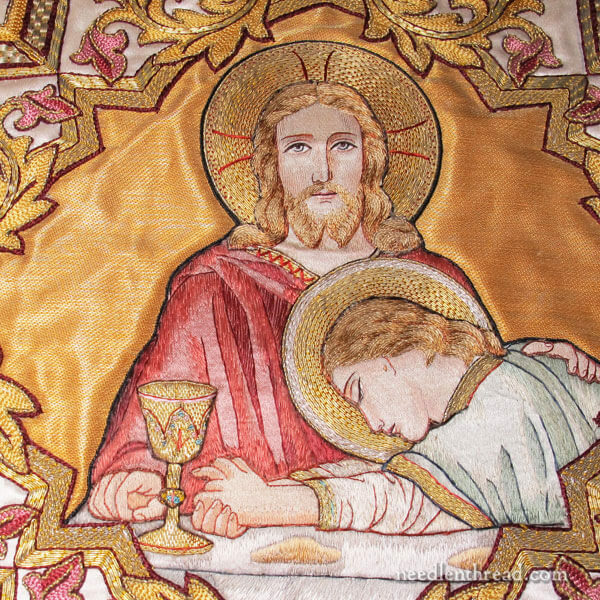 How I would love to learn how to do such magnificent embroidery for the Church. Thank you so much for sharing and for explaining it in such detail. Mary, does the owner of the piece have plans for the rescued elements? One thing for sure deciding on how much of each section can be rescued will depend on what you see after removing the lining. That will determine how you can design the rescue. There is much that is lovely in the sample vestment and would be a shame to loose. The rose and the lily would be nice to keep if possible. They each might make ‘center piece’ of a stole or even an offrey. Wow! Wish the Church here in the USA still used these. The Catholic church that I attended during my childhood had wonderful old vestments like these, but a younger priest came in 20 years ago and decided that they were the devils work and burned them. So what is your goal with the embroidered ecclesiastical figures? Are you going to produce a new chasible? Use it on another vestment? I am Episcopalian so I am familiar with vestments and the piece is in excellent shape and worth saving. I will be following your adventure! Yes, Lois, they will go on new chasubles. I’ll most likely make similar frames for them in gold, after mounting them on new cloth. Te deseo mucho éxito en el trabajo! I love it that you are doing this project & sharing it with us! For the past year I have been working with a group of embroideries & sewing at our Diocesan house in Seattle altering and restoring chasubles & other liturgical garments. I am the newbie at this shop & anxious to learn more. Mary vous avez de l’art de vos doigts, j’ai hâte de suivre pas à pas la réalisation de la broderie en applique. Je viens de terminer une nappe d’autel pour une chapelle de la Vierge. Je suis très satisfaite de ma réalisation. Hi, Laura – You might look up LaLame in NYC. You used to be able to order a catalog (on CD) from their website, because they don’t have a full retail site, but I don’t know if they still do that or not. The ecclesiastical part of their site doesn’t come up for some reason. But if you go to their regular website, and go to “contact” you’ll find some contact info there. Two other excellent sources for a variety of liturgical fabrics in the USA are Almy and Church Linens. Almy commercially produces a large number of products. Church Linens is more artisanal and does more custom and one off items. Both have some great fabrics! Yes, Elizabeth Morgan’s site, Church Linens, is excellent! Her fabrics come from M. Perkins in the UK – they provide some very nice fabrics. I used their St. Margaret line for the vestment that the Marian Medallion went on. I find Almy’s selection a bit narrow, compared to LaLame. If you want to go farther afield from the US for ordering, M Perkins & Sons has a nice selection of fabric, and Watts & Co in the UK is also a good source. They have very distinctive liturgical fabrics. Thank you Mary for the LaLame information. I am ordering a catalog today – their web site shows a little of their products but a catalog will be wonderful! What a treat! I can’t help but wonder about the people who created this piece. Did woman traditionally do the embroidery? Would they have been held in high esteem in their communities or was the studio a sweatshop? Was it created by a guild? Thanks for sharing this lovely piece of history!! This is going to be so interesting to watch unfold. Thanks for sharing it with us! 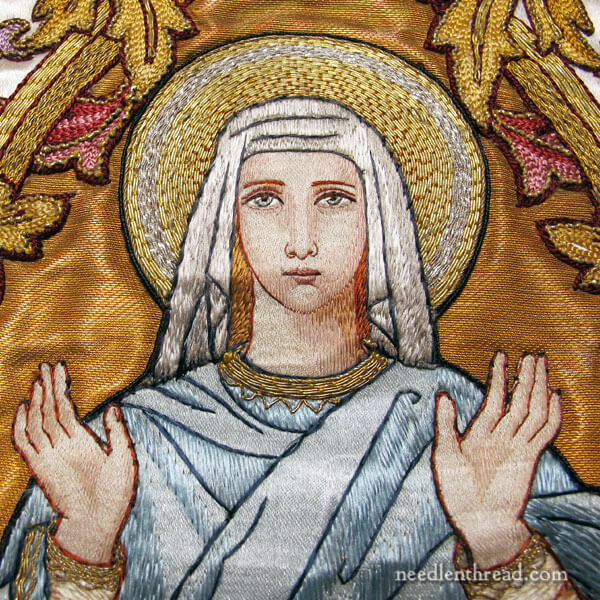 Thank you for the very interesting article on ecclesiastical embroidery. This is what I love about your site – learning something new and seeing something very old and beautiful. I love to think about the people working on the project and how they worked together and how they came up with such lovely work. when you say you are taking this piece apart and only salvaging the figures how much are you actually going to be taking away. As I understand it you will be removing the cross outline but how much of the inside will be salvaged and how much is going to be removed? Are you hoping to remove the appliquéd pieces as a whole to go on something else? I guess for me so many of the pieces are so intertwined I wonder how much off each figure will go. Hi, Mickey – Here’s my latest post on this project: https://www.needlenthread.com/2017/07/embroidery-archeology-first-things-first-documentation.html You’ll find a little more clarification in there. The cross is not salvageable as a whole, as you can see from the photos. I’m salvaging the figures only, although I may salvage some of the floral elements, if possible. I’ll share more on the project as I get along with it, so that the rest of your questions can be answered. Bellísimo como todo lo que haces!! Saludos desde México! Hi Mary, I haven’t read your complete articles on this archeological project. All I want to say is that I really like the foliage circling the medallion and am a bit disappointed that you don’t regard it with much interest. I think the several foliage arrangements could be used for framing secular projects so if you would give us the patterns you’d have at least one very happy customer. Good luck with your savage work. I look forward to watching your progress. My mother used to do repair work for our church when I was teenager, as well as original designs. It was just before Vatican II and we were an old German/Italian/Polish community in the heart of Rochester NY. We didn’t know everything would be swept away in a few decades. It’s all gone now and I don’t know where all her wonderful work went, a trash can, I suppose. VERY sad! I often helped her after finishing my homework, if only fetching her scissors, which fell every minutes, and threading needles. She would tell me stories of her childhood in Italia and I memorized some of the most wonderful stories you can imagine. It all gave me a love of handwork I have never lost. I hope to finally learn white cut work. Thank you again! My love for handwork is rekindled by everything you do. Next Next post: Shisha & Variations: How to Add the Magic of Mirrors (& More) to Your Needlework!